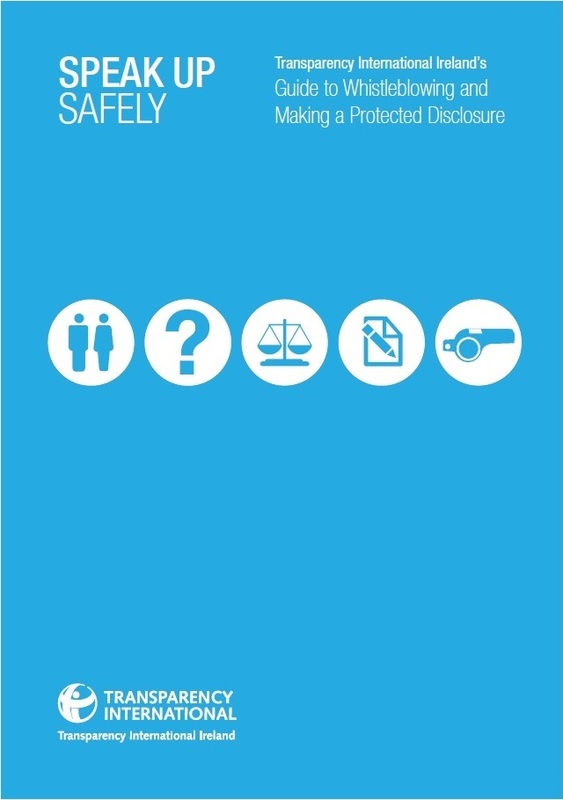 Transparency International Ireland (TI Ireland) have launched the country's first public information video and guide on whistleblowing, both titled 'Speak Up Safely,' today. TI Ireland’s video and guide are aimed at helping workers understand the new whistleblowing legislation, the 'Protected Disclosures Act 2014,’ and the guide shares practical tips on blowing the whistle safely. The guide has been written using TI Ireland’s experience of operating its free-phone Speak Up helpline for whistleblowers including Garda Sergeant Maurice McCabe and former Garda John Wilson, as well as witnesses and victims of corruption. The Government introduced the Protected Disclosures Act in July this year and TI Ireland advised on the drafting of the new law. The legislation has recently been used to share allegations of a cover up in the investigation of alleged Ansbacher account holders and claims of wrongdoing in the Irish health service. “We’ve come across too many cases where people have spoken up without either getting legal advice or being aware of the personal consequences of doing so. Whistleblowers and people supporting them should be aware that there is help available before and after they raise a concern,” said John Devitt, Chief Executive of TI Ireland. “The new Protected Disclosures Act provides a safety net for people who want to report wrongdoing they encounter at work. But, like any piece of legislation, it can be difficult to navigate. This guide and video are aimed at helping people better understand the new law. They also set out the practical steps workers should take before and after they report,” said Susheela Math, Legal Counsellor at TI Ireland. TI Ireland has been operating the Speak Up helpline since 2011 serving over 500 clients. It will launch a report on its key findings early in 2015. December 9 also marks the United Nations' International Anti-Corruption Day and TI Ireland will be joining in the call for the Irish Government to establish a registry of beneficial ownership of companies registered in the country. Such a registry would help prevent the use of Irish companies as corporate vehicles for international bribery and tax evasion.